I mentioned on Wednesday that I wouldn’t have a Five Minute Friday card on Friday because I wanted to share another project instead. Last night was our monthly Downline Meeting and I’m sharing my swap that I made. I share these with you after the Downline Meeting because I want the girls to be surprised when they get their swap. I love getting together every month with these ladies! I love celebrating their successes and cheering them on with their goals. 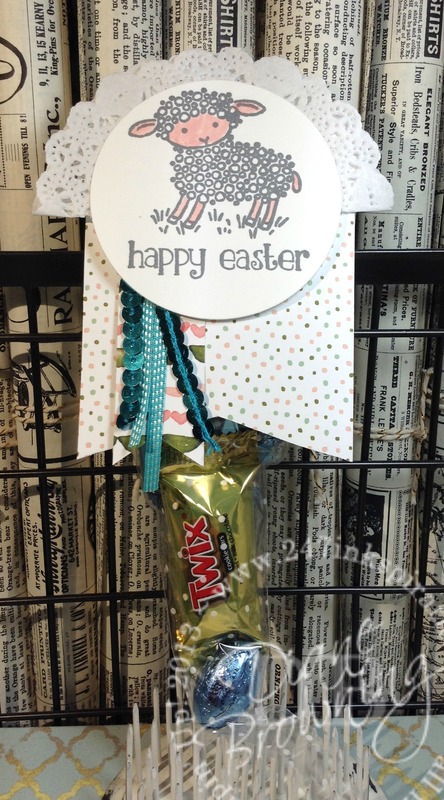 Our swap theme this month was Easter or Spring. 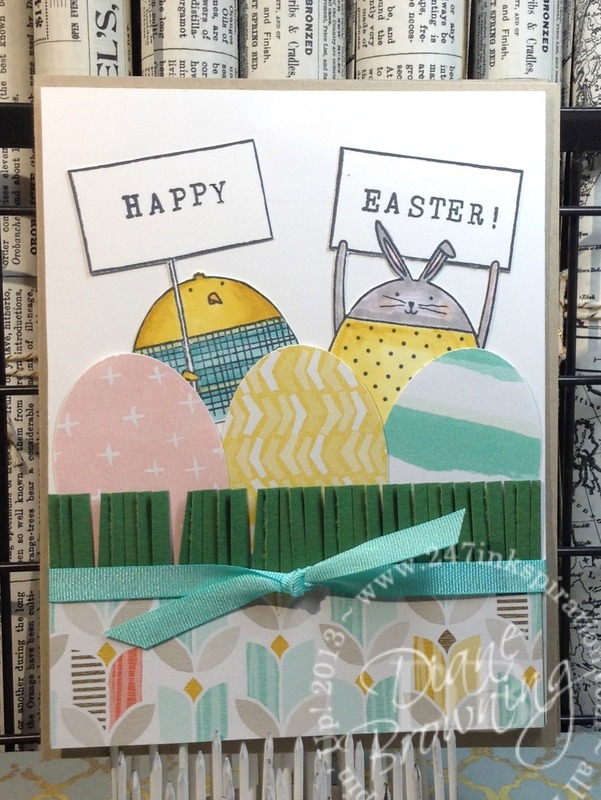 If you’re flipping through the Occasions Catalog looking for a selection of Easter stamp sets, you aren’t going to find them. Much to peoples’ dismay, this year there just aren’t any cute little bunnies and eggs in there. Instead, Stampin Up came out with a single stamp with an adorable lamb. The lamb is really cute and requires almost no coloring. It’s hard to see in the picture, but the candy is inside the Polka Dot Cone Cellophane Bag. These are a great deal at $6.00 for 25 bags. You can see the bags a little better in the picture below. 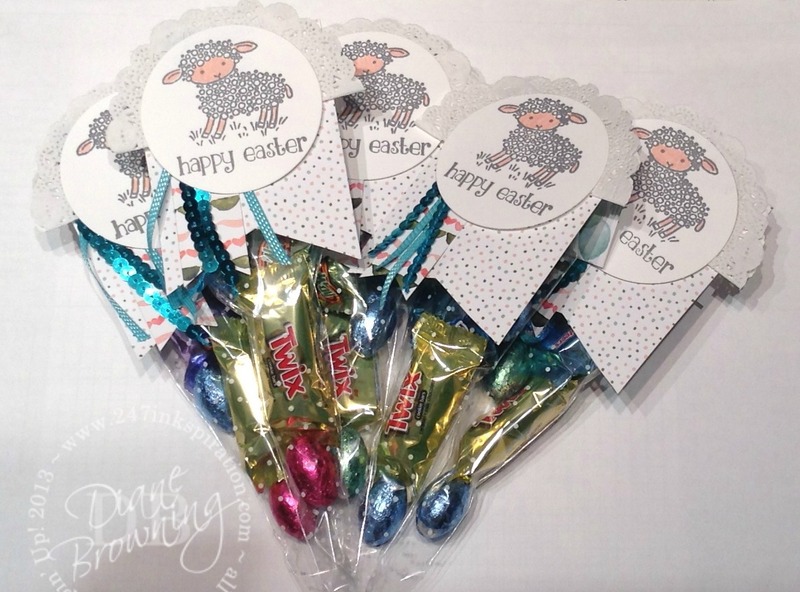 If you’re hosting Easter at your house, these would make a cute place setting on the table. You could easily add a name below the “Happy Easter”. If you’re not wild about the lamb and want to stick with eggs, this is the Easter Card I made for last year. The stamp set is retired, but you could still make something similar to the eggs in the grass using your oval punch and the fringe scissors. If you want to know what we do at our Downline Meetings or if you’re curious about what it’s like to be a Stampin Up Demonstrator, just let me know. We always welcome guests!